Love drinking mochas? 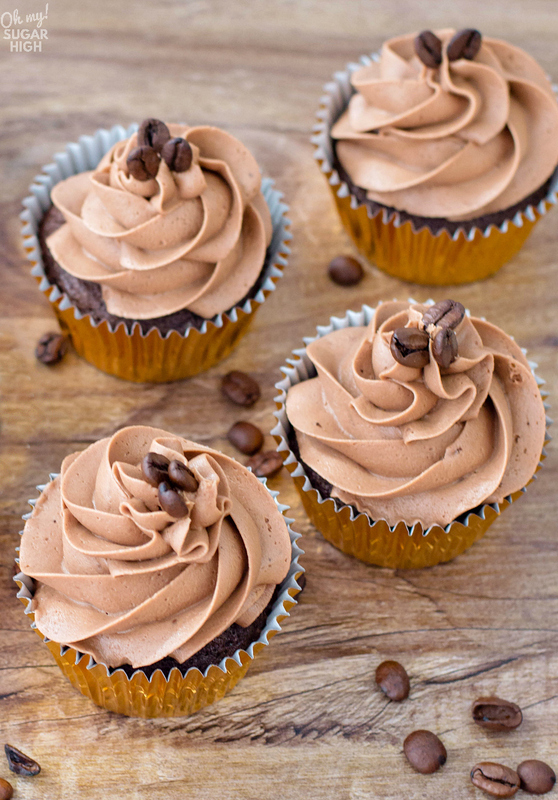 You’ll love these chocolate coffee cupcakes with mocha frosting! 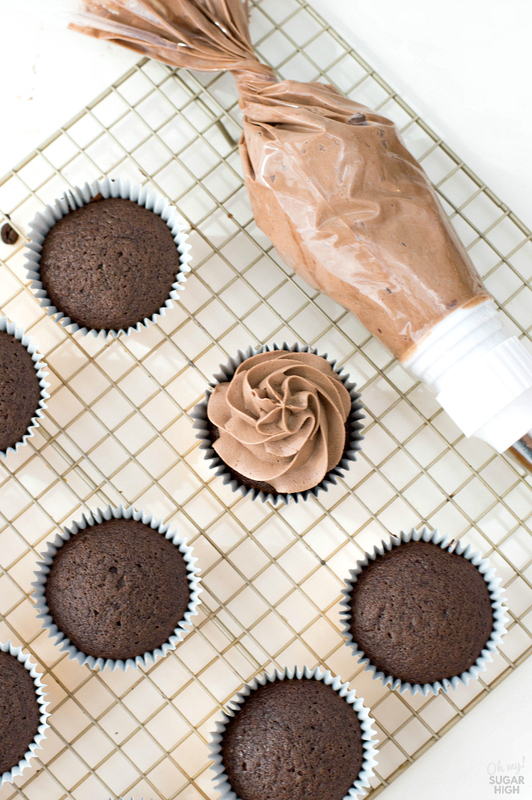 This chocolate cupcake recipe from scratch features a subtle coffee flavor that can be made stronger to suite your tastes. The mocha buttercream frosting offers a second shot of that delicious chocolate coffee combination. 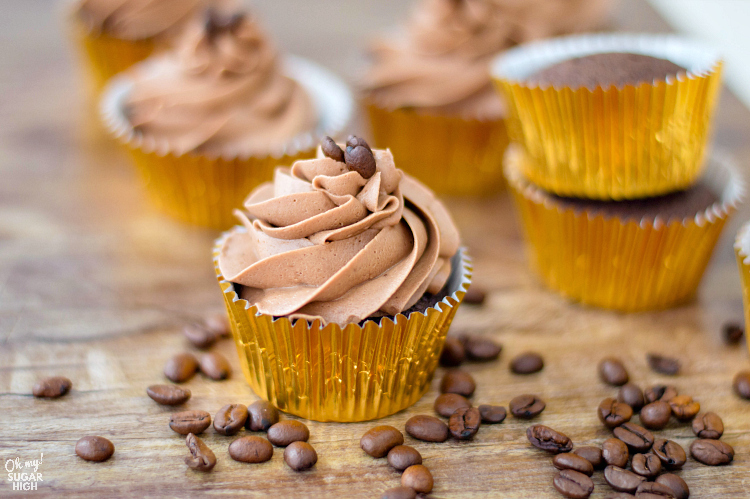 No coffee lover will be able to resist this delicious mocha cupcake. You can control how prominent the coffee flavor in these cupcakes by how strong you make your coffee. For a standard cup of medium roast coffee, the coffee flavor is subtle and the chocolate stands out more. If you brew your coffee very strong, you can bring out a more robust coffee flavor. To make these coffee cupcakes you’ll want to start by heating your oven to 350 degrees and adding cupcake liners to a muffin pan. In a small bowl, sift your flour, cocoa powder, baking powder, baking soda and salt. Can you skip sifting ingredients? Sifting the dry ingredients together will make sure that your ingredients are not only well combined, but this process will also aerate the flour for a light, airy and delicate texture in your finished goodies. In another bowl, mix together sugar and eggs until creamy. 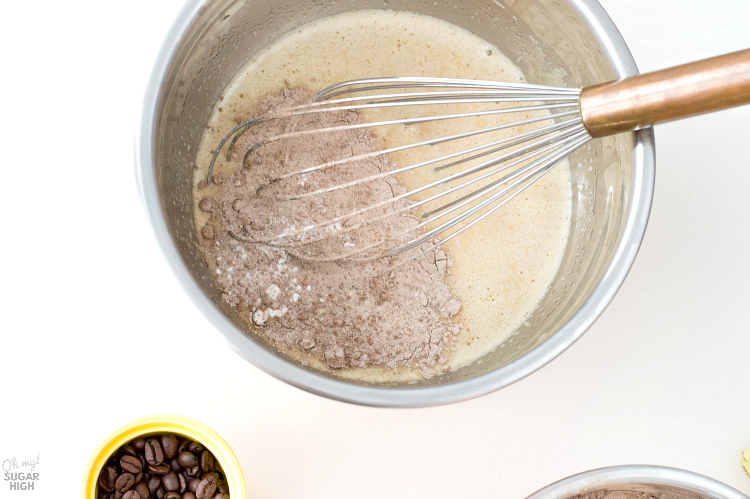 Add oil and coffee to your egg mixture and whisk until well-combined. Slowly add dry ingredients into your bowl of wet ingredients and whisk together. Add boiling water into your mix and stir some more. Why add boiling water to chocolate cake? By adding boiling water it helps to create a deeper chocolate flavor by “blooming” the cocoa powder. Blooming essentially releases flavor that is trapped in the solid particles. Pour the batter about 2/3 of the way in each of your baking cups. Bake for approximately 15-18 minutes or until a toothpick comes out clean when you insert it into the center of a cupcake. Allow to cool completely on a wire rack. 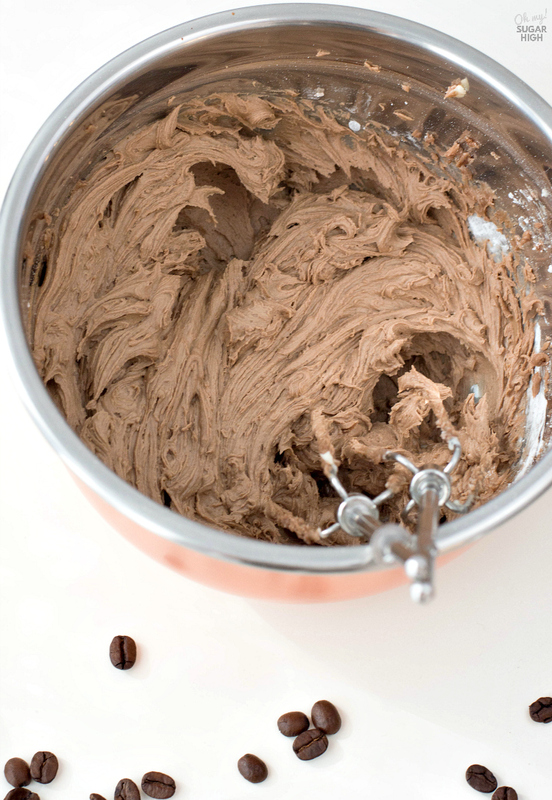 To make this delicious mocha frosting, beat together butter, powdered sugar, milk, coffee and cocoa powder. Once again, the coffee flavor is more subtle with this recipe so use a stronger coffee if you’d like it to stand out more. Start on slow speed and gradually increase to high. The buttercream frosting is ready once all ingredients are thoroughly combined, smooth and form semi-stiff peaks. 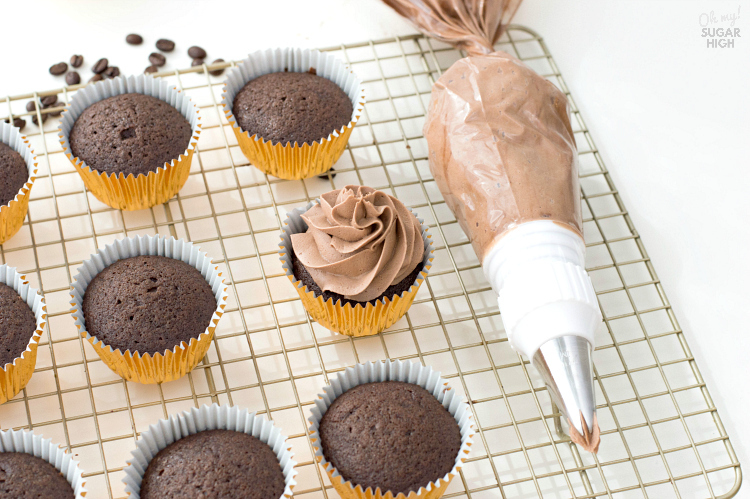 Scoop your mocha buttercream into a large piping bag with Wilton tip #1M attached. (I recommend this set of decorating bags with tips.) You can use a coupler if you like with your bag or simply snip off the end. I typically only use a coupler when I plan to switch out the tips. Frost each cupcake by going around the outside of the cupcake in a circular motion and ending in the center. Top each cupcake with one to three coffee beans. 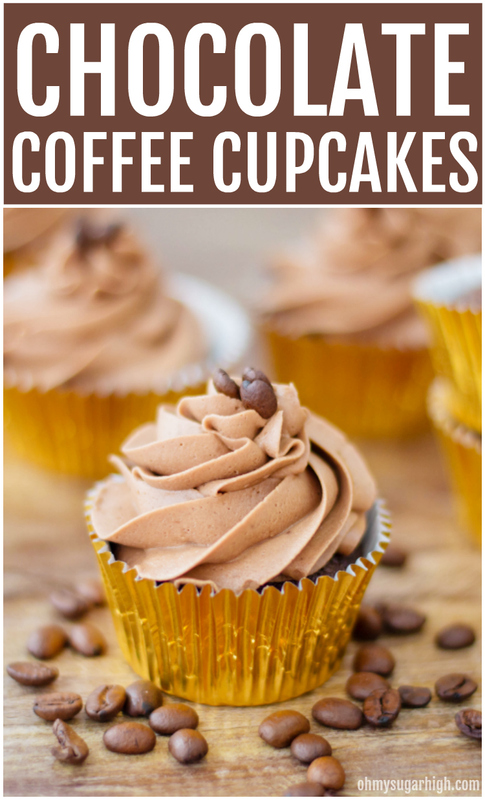 That is all there is to making these delicious and moist coffee cupcakes! Preheat your oven to 350 degrees F. Line a muffin pan with paper liners and set aside. In a small bowl, sift together flour, cocoa powder, baking powder, baking soda and salt. In another bowl, whisk together together sugar and eggs until creamy. 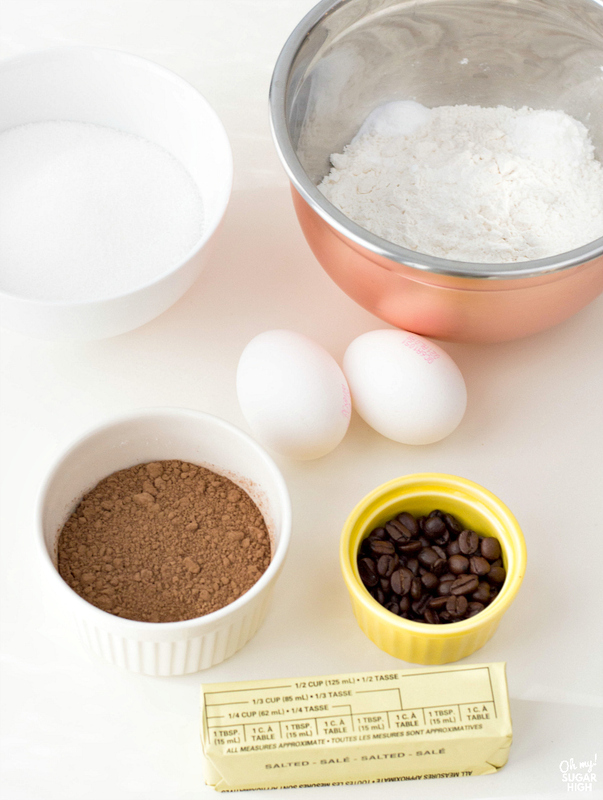 Add oil and coffee to your egg mixture. Whisk until well-combined. Slowly add dry ingredients into your bowl of wet ingredients and mix until well-combined. Add boiling water into your mix and whisk some more. 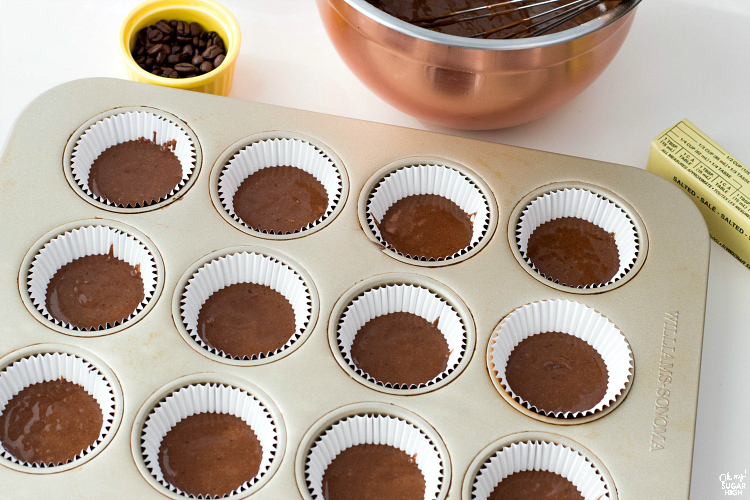 Pour the batter into each section of your lined muffin pan, about 2/3 of the way in each. Bake for 15-18 minutes or until a toothpick comes out clean when you insert it into the center of a cupcake. To make mocha frosting, beat together butter, powdered sugar, milk, coffee and cocoa powder using an electric mixer.. Start on slow speed and gradually increase to high. The buttercream is ready once all ingredients are thoroughly combined, smooth and form semi-stiff peaks. Scoop buttercream into a large piping bag with Wilton tip #1M attached. Frost each cupcake by piping in a circular motion, starting at the edge and ending in the middle. Top each cupcake with one to three coffee beans. Yields 18 to 22 cupcakes. The coffee in this recipe is more subtle while the chocolate is more prominent. Use strongly brewed coffee to bring out more of a coffee flavor. 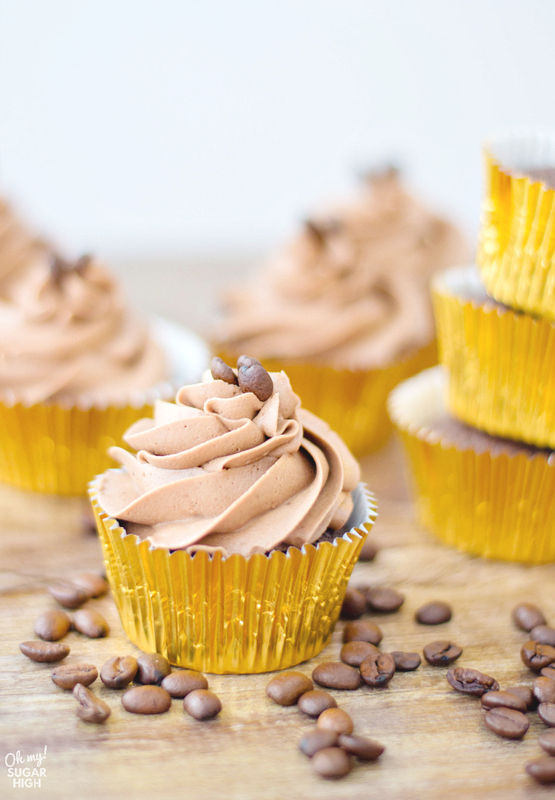 Thank you to Lisa at Fabulous Habits for this amazing coffee cupcake recipe!